Performance Lab Energy innovates energy supplements by working on a cellular level, without the use of caffeine. By boosting cells’ power-plant mitochondria, it may increase energy in every cell in your body — replacing “spike-and-crash” stimulation with clean, sustained revitalization. Let’s see why this strategy may be the next quantum leap for energy pills in our Performance Lab Energy review. Multifaceted mitochondria booster . Synergistic ingredients boost, protect and multiply cells’ power-plant mitochondria in many ways. Broader energy benefits . Metabolic design boosts mental and physical energy and beyond, helping exercise, weight management and training results. Caffeine free. Designed for cell energy, not super stimulation; a cleaner, healthier, more sustained vitality lift with no jitters or crashing. Suggested Use: Take 1-2 capsules in the morning or early afternoon. For best results use daily and consistently. Meet the evolution of energy supplements: Stim-free cell mitochondria boosters. Energy supplements are changing, with many people experiencing a collective crash from long-term use of caffeine. This has led to the emergence of energy supplements that target the mitochondria (which are the “powerhouses” of our cells) to boost vitality at a cellular level. Cells’ mitochondria produce ATP energy that powers life. Performance Lab Energy is designed to charge-up, multiply and protect mitochondria, for a whole-body cell energy boost. Performance Lab Energy is not the first mitochondrial energy booster – but it’s the best so far. Let’s take a look at the ingredients in this Performance Lab Energy review, and discuss how they work together to raise energy levels in a healthy new way. With CoQ10, we already get a hint of Performance Lab Energy’s deep formula strategy. Without CoQ10, cells cannot generate energy. That’s not just for humans, but for any living organism on planet earth. Here’s why: CoQ10 transports electrons, a function that enables all bioenergetics. Without CoQ10, cell energy production and utilization stalls out. CoQ10 may also enhance mitochondria. 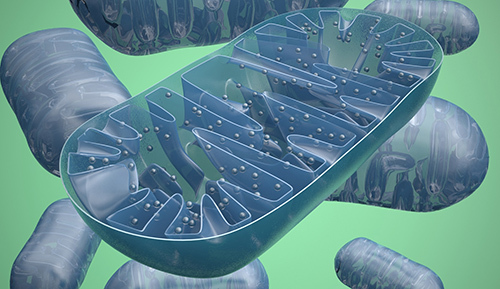 It has been suggested in animal research to multiply mitochondria and help them to be more active — adding up to greater ATP energy synthesis in cells. Performance Lab Energy uses MicroActive® Q10: An extended 24-hour release CoQ10 shown to double CoQ10 blood levels in 3 weeks in 100% of study subjects. Animal research has shown that PQQ raises activity of cells’ mitochondria powerhouses. This may promote whole-body energy. In this animal study, researchers suggested PQQ helped to stimulate mitochondrial biogenesis and may be helpful to those in need of mitochondrial support. PQQ’s unique mitochondria support may do more than energy — it has been suggested to have anti-aging benefits, and may deliver some brain-boosting nootropic benefits, too. ALCAR works by carrying fatty acids across cell membranes, including crossing mitochondria membranes to deliver fatty acids as fuel for energy production. ALCAR is highly concentrated in muscle tissue, and helps to powercharge strength before workouts, while encouraging the body to burn fat for energy – keeping energy stored in muscle to extend workouts. ALCAR seems to back Performance Lab Energy’s “physical training” claims. Some human research also backs this idea, showing that ALCAR taken as a pre-workout supplement seems to spike energy, extending strength and endurance. Acetyl L Carnitine also has some mitochondria protective activity. It functions as an antioxidant while regenerating the activity of other antioxidants, so it’s great at maintaining mitochondrial integrity for peak energy production. ALCAR’s Keto Diet Bonus Benefit: Ketogenic diets work by making the body burn fats as fuel (instead of carbs). ALCAR is a popular fat burner for keto dieters because of its role in funneling fatty acids into mitochondria — helping to burn off pounds more efficiently. Within the mitochondria, R-Lipoic Acid is the orchestrator that activates and coordinates all the various enzymes that are involved in turning dietary carbs into usable ATP energy. To put it simply, R-lipoic acid helps to fuel and fire cells so that they turn out ATP with greater efficiency. R-lipoic acid is also a Universal Antioxidant that protects against free radicals throughout all parts of the cell, including the mitochondria. With this ingredient, Performance Lab Energy brings us another mitochondrial multitasker, which helps tune up mitochondrial performance while protecting mitochondria from the membrane damage that causes them to power down. Acetyl-L-Carnitine and R-Lipoic Acid may boost more energy together than alone. By combining these two mitochondria-boosters, Performance Lab Energy delivers a smart, cutting-edge nutrient stack for boosting cell energy. If you read Best 5 reviews, you probably already know that we are big fans of black pepper extract, mostly seen in fat burners, pre-workouts and other sports supplements. Why are we fans? Black pepper extract helps the body to absorb nutrients more completely — which can improve the overall potency of a supplement. In Performance Lab Energy, black pepper extract is probably intended to enhance CoQ10, mostly. Clinical research has shown that black pepper boosts the absorption of CoQ10 by about 30%. Plus, black pepper extract has some thermogenic activity that might play well with Performance Lab Energy’s claims for fat loss and body composition. Performance Lab Energy uses BioPerine®, a patented black pepper extract standardized to 95% piperine and backed by positive human research studies. Performance Lab Energy features a unique interlocking design of nutrients that all focus on enhancing mitochondrial function from many different angles. The result is a broad spectrum mitochondrial booster, with additional complementary support for other pathways involved in cell energy production at the most fundamental level. Performance Lab Energy targets and optimizes cells energy-producing mitochondria in more ways than any other energy-booster that we have seen on the market. Performance Lab Energy’s support starts with core fundamentals – compounds that are absolutely required for the process energy production. It includes cofactors that are needed for the body to turn macronutrients – fats, carbs, and proteins – into the ATP energy that powers our lives. Overall it is the most sophisticated energy supplement yet developed, and the best overall energy-booster — especially for people looking for stim-free vitality support. Performance Lab Energy’s primary benefit is whole-body cell energy enhancement. It helps unleash revitalizing feelings of energy that are unlike the “dirty” energy spike (and subsequent crash) of stimulants driven energy booster formulas. 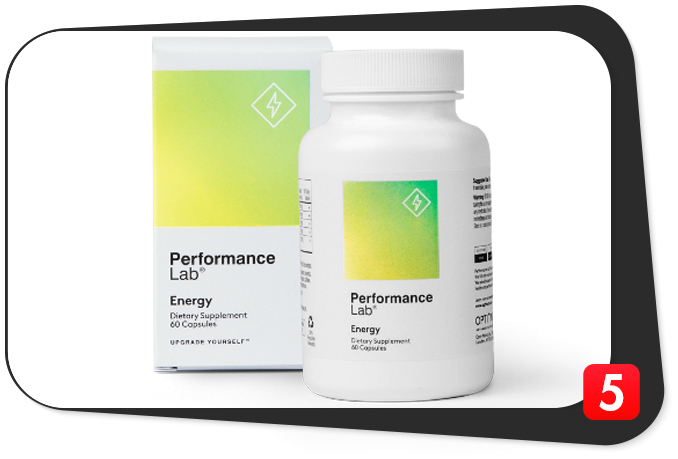 Performance Lab Energy boosts the vitality that you need for superior performance in both body and mind, while boosting energy that is also needed for healthy overall function. Performance Lab Energy will be appealing to anyone who is tired of the stimulant jitters and spike-and-crash challenges of ordinary energy supplements. Anybody can benefit from this booster. It may also be taken by active and competitive individuals in both the physical and mental arenas. Performance Lab, the manufacturer, seems to target competitive and driven individuals with its formulas for human performance optimization. Note: Performance Lab emphasizes this formula’s ability to revitalize physical training, body composition, fat loss and cognitive function – making it an energy supplement for more specific lifestyle needs, as well. Lots of energy supplements have side effects. Usually from stimulants, caffeine, and using cheap junky ingredients. They often get away with it because pretty much everybody wants to boost energy, side effects or no. Performance Lab Energy is safe and free of side effects because it doesn’t rely on harsh stimulants like your typical energy supplements often do, and has an extremely clean label. Beyond being stim-free, Performance Lab Energy might just be the cleanest energy booster on the planet — no junk additives. Plus, Performance Lab Energy’s cellular approach to energy enhancement is made to be far more tolerable than “spike-and-crash” strategies taken by stim-driven energy booster products. Advanced mitochondrial support. Supercharges energy at the cellular level, for a whole-body power up. Premium ingredients. Superior quality branded nutrient forms, backed by research demonstrating safety and efficacy. Strategic formulation. Bioenergetic basics for mitochondrial power production, combined synergistically to maximize the energy boost. Effective dosing. Good potency, with activity amplified by absorption-boosting black pepper extract and advanced nutrient forms. Clean label No weird artificial fillers or colors, just pure mitochondrial energy support in vegan PlantCaps. Safe, legal and easy on your system. Free of caffeine or any other stimulants, a natural, legal way to boost cell energy and mind-body performance. This Performance Lab Energy review details why it is the best energy booster on the market today. It has a more sophisticated design than typical energy pills, and solves problems energy boosters often have: Things like side effects, jitters, energy spikes and crashes, and a net overall loss when it comes to life vitality. Performance Lab Energy is also made to be healthy. Clean, natural and stim-free, it raises vitality while energizing the organs and body systems for healthy peak performance. Take it to experience a different kind of mind-body energy that can help you excel in all that you do.